SEMPORNA: The younger generation need to be educated on the importance of maintaining the sea turtle population in the waters around Sipadan and Mabul islands off the Sabah coast. Dr Pushpa Palaniappan, a senior lecturer of Borneo Marine Research Institute, University Malaysia Sabah, who expressed this opinion, said while the communities along the coastal regions were beginning to understand the need to preserve the sea turtle numbers, it took time to change the general misperception people had on conservation. In fact, the sea turtles were on the verge of extinction because of apathy towards saving them from dying out, she added. The main factor is the selling and eating of turtle eggs. For instance, some poor families sell turtle eggs to earn a better income. Apart from this, callous fishing methods trap the turtles in nets, causing them to drown. The turtles would also become sickly and thinner through “food poisoning” if they ate too much plastic thrown into the sea by the irresponsible people. The turtles usually mistook plastic bags or sheets floating on the surface for jelly fish which form part of their natural diet. Generally, sea turtles are on their eve of destruction due to habitat and nesting site loss, pollution, predation, over hunting and a lack of understanding of their important role in maintaining the equilibrium of the ecosystem. The World Wide Fund for Nature (WWF-Malaysia) plays a vital role in providing awareness education programmes on preserving sea turtle population for the younger generation. In this regard, Dr Pushpa thanked the government, non-governmental organisations (NGOs) and society in general for their co-operation and help. She was in Semporna recently to attend a prelude event of World Turtle Day 2013 held at Uncle Chang’s Resort on Mabul island. Programmes for catching, measuring and tagging turtles were organised for the guests. World Turtle Day 2013 will be held on May 23 to bring attention to, increase knowledge of and respect for turtles and tortoises as well as encourage human actions to help these marine reptiles survive and thrive. The Borneo Marine Research Institute (BMRI), Universiti Malaysia Sabah – in collaboration with Uncle Chang’s Resort, 1Borneo Ballroom Sdn Bhd and The Borneo Connections Sdn Bhd – plans to commemorate World Turtle Day 2013 by conducting an underwater census of the resident sea turtle population in the waters of Mabul. The turtles will be caught, photographed, measured, tagged and returned to the sea. The objective is to create public awareness and enhance education, research and conservation of the sea turtle population in the area. The organisers will open the event to Resort guests to give them hands-on experience on sea turtle research. Primary schools in Mabul will also be invited to observe World Turtle Day activities there. Tourism, Culture and Environment Minister Datuk Masidi Manjun will officiate at the event. World Turtle Day in Mabul will be an annual event to be included in Sabah tourism calendar to encourage participation from domestic and international tourists. This long-term project will enable BMRI to collect annual growth rate data on the sea turtle population in Mabul for conservation purposes. Sea turtles are highly migratory sea-going reptiles, believed to have existed since the Triassic period, about 200 million years ago. They are air-breathing animals that spend most of their life in the sea. Most have a similar life cycle. The baby turtles enter the surfs upon hatching and are only seen again as juveniles at foraging grounds. Once they have reached maturity, they will migrate to their natal beaches where the females will lay numerous clutches of eggs in the sand. The turtles will return to their foraging grounds at the end of the nesting season to prepare for the next reproduction season. The interval between seasons can range between two and seven years.There are three species nesting in Sabah – the green (chelonia mydas), hawksbill (eretmochelys imbricata) and the olive ridley (lepidochelys olivacea). 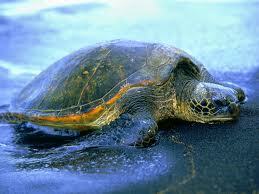 The numerical ratio between green turtles and hawksbills is 10 to one. Two other species – leatherback (dermochelys coriacea) and loggerhead (caretta caretta) also traverse the waters of Sabah, migrating from their foraging grounds to their nesting beaches on the surrounding islands. Pushpa disclosed her research team had found 126 sea turtles in 2010-11 and 12 more in 2012 at Sipadan. Sea turtles live up to 70-80 years on average while the younger ones (average age 10 years) are called juveniles. The height of their breeding season is between July and November. Uncle Chang, founder of Uncle Chang’s Sipadan Mabul Dive Lodge, is very supportive of World Turtle Day and plans to hold it annually. He hoped other companies would support and participate in the celebration to help preserve the sea turtle population in Mabul. Uncle Chang will set up 120 resorts on another two islands – Mega and Kalapuan – this year to promote tourism, especially on the east coast of Sabah. His management team has done a lot to preserve the natural resources of the area and also embarked on beautification projects to attract tourists to Sabah. Semporna’s tourism sector statistics showed a drop in arrivals three weeks ago due to the intrusion of Sulu gunmen but the situation has returned to normal. According to Uncle Chang, all the stakeholders, including the government, have vital roles and responsibilities in boosting the tourism industry in Sabah. “This is important for the economy of the state and the nation,” he said.